This past week the Twins made several notable moves that affected their payroll – signing free agent reliever Joel Zumaya and coming to terms with several arbitration-eligible players including Glen Perkins and Francisco Liriano. The Twins signed Zumaya to an incentive-laden deal that can be as little of a commitment as $400,000 if he fails to break camp with the team all the way up to $1.75 million if he reaches certain performance bonuses. Shortly thereafter, the team agreed to deal with Perkins ($1.55 million) and Liriano ($5.5 million) while continuing to work on an agreement with their last arb-eligible player, second baseman Alexi Casilla. Casilla’s camp submitted a figure of $1.75 million while the Twins countered with a deal offered $1.065. Considering this organization does not enter arbitration with players regularly, it is assumed that the team and Casilla will eventually split the difference on a one-year contract. At the $98.5 million mark, the payroll is right in that sweet spot of where Ryan was describing. Because of that, it isn’t necessarily a given that the team will seek to spend that $1.5 million remaining from the assumed $100 million payroll. If Ryan opts to close up shop right now and move forward with the present lot, no one could blame him. Then again, that wouldn’t be in the best interest of the on-field product, especially considering the state of the bullpen. Even though Zumaya could be a very capable arm, based on his injury history, there is no guarantee he can sustain the duration of the season (in fact, I would easily bet against him making the maximum of his contract). Outside of Zumaya, the Twins have a bevy of intriguing yet unproven right-handed arms. 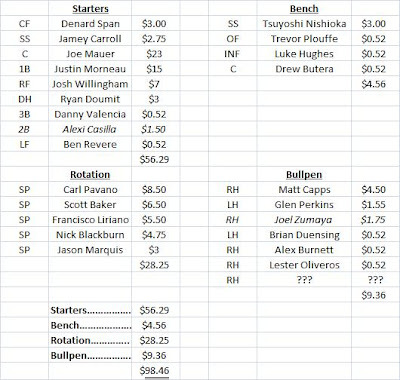 The most prudent thing would be to use that money towards signing someone like Todd Coffey or Dan Wheeler. As I outlined recently, Coffey could be a valuable but inexpensive addition to the bullpen to stave off right-handed foes. Making just $1.35 million with the Nationals last year, Coffey figures to have his potential earnings diluted in the current plethora of relievers on the market and could easily be signed for $1.5 million or less. Meanwhile Wheeler, who is even more of a threat against right-handed hitters than Coffey, made a pretty penny in Boston a year ago ($3 million) but a shoulder injury at the end of the season combined with the deep market could also push him into that $1.5 million range as well. Either option would be a solid addition to deepen a fairly shallow bullpen. For the Twins, who are down to their final few schillings, choosing to spend that $1.5 million to land a bargain bin-priced reliever would undoubtedly strengthen the pitching staff. Can a focused Burroughs be useful to the Twins? On Monday, the Star Tribune’s Patrick Reusse recounted the tale of Sean Burroughs, a recent Twins minor league signing this winter, whose life was derailed by drinking and drugs in his twenties. In his first four seasons of professional ball in the Padres organization, Burroughs hit a remarkable .324/418/.453 in 1,653 plate appearances. Baseball America anointed him the seventh best prospect in 2000 then the sixth best in 2001 and finally the fourth best in 2002. He was the proverbial “can’t miss” prospect. From 2003 to 2005, Burroughs hit .283/.343/.366 with the Padres. While in a different era his batting average may have been lauded, in the modern era that puts emphasis on reaching base AND hitting for power, Burroughs’ stock tumbled in San Diego. People began to wonder where the power - the one that baseball minds predicted he would eventually develop - was. Midway through 2005, the Friars traded for Joe Randa, who was having a solid season in Cincinnati at an extremely hitter-friendly ballpark. This was the beginning of the end for Burroughs in San Diego. Never mind that upon reaching the west coast and Petco Park Randa’s numbers tumbled to .256/.303/.395 – hardly an improvement over what Burroughs was providing them – but Burroughs’s off-field shenanigans likely accelerated his exit. “It began sometime in 2005, his fourth season with the Padres, Burroughs recalled, when he became more concerned with postgame plans than actually succeeding under the lights at PETCO Park. Burroughs struggled to pin down the reason he took the path he did, though one wrong turn was all it took to get stuck. The Padres would trade Burroughs to Tampa in exchange for another failed prospect in Dewan Brazelton but Burroughs would flounder in Florida as well. In 25 games for the Devil Rays, he hit .190/.320/.238 and earned a release in August. This begat a trail run with the Mariners the following season that lasted until June. After that, Burroughs disconnected from the world in Las Vegas, accumulating war stories which he claims would make Josh Hamilton blush. The 30-year-old Burroughs cleaned himself up and earned a spot into the Diamondbacks system. While in AAA Reno last year, he produced well in 110 plate appearances, hitting .412/.450/.618. Impressed, Arizona buoyed him between the big club and their top affiliate, chiefly using him as a pinch hitter off the bench (58 of his 115 plate appearances can off the bench). In that limited time at the big league level, Baseball America’s one-time number four overall prospect hit .273/.289/.336 with five extra base hits. While he’s a fantastic feel-good story worth of a Disney biopic, what are the odds we’ll see Burroughs at Target Field in 2012? Based on his track record, it might be fairly decent. Furthermore, where the right-handed hitting third base incumbent has been thwarted by same-sided nemesis (a career .283 OBP against RHP), Burroughs’s little major league success is predicated on him being able to reach base against righties (.350 career OBP against RHP). If added to the roster, he provides a solid platoon option. 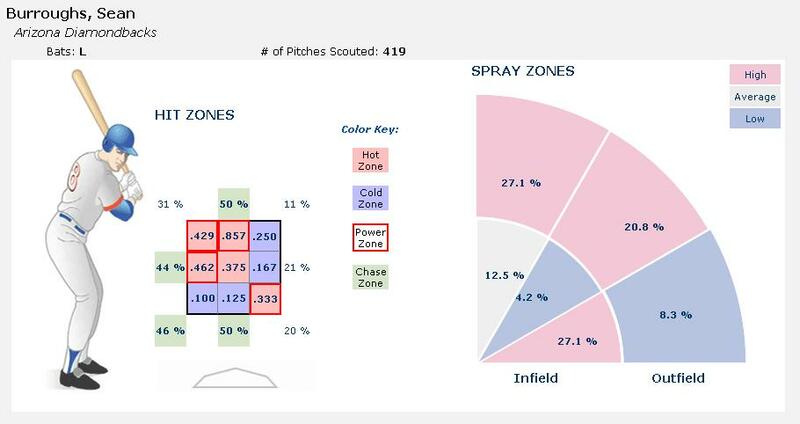 What’s interesting about Burroughs’s approach at the plate is that the left-hander has an inside-out swing, one that produces numerous opposite field and up-the-middle hits. This resulted in Burroughs hitting .565 on balls hit to left while hitting just .143 when pulling the ball in 2011. Although many baseball people thought Burroughs’s power would eventually develop, it is more likely that his approach would never allow for a great deal of home runs – much like a certain Minnesota catcher (with the exception of one season). Because of his keen batting eye and ability to get base hits by using left and center fields, Burroughs maintained an average of .317 and an on-base percentage of .400 in the minors. While playing in the Venezuelan Winter League this winter, Burroughs continued by hitting .316 and posting a .396 on-base percentage in 136 at-bats. 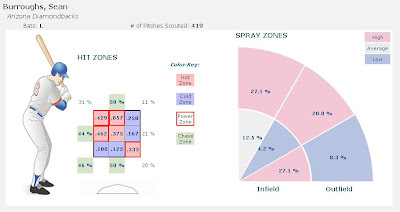 It is possible that given the opportunity to hit in more favorable situations against right-handed pitchers, he could potentially put up similar numbers. If Valencia cannot improve on his defense and his struggle against right-handed pitching persists, don’t be surprised to see Burroughs in Minnesota. At the very least, Burroughs can be a Rochester reminder for the current starter – hopefully pushing him to improve his game.